Thank you for putting the effort into this and sharing with the community. Only one ask. 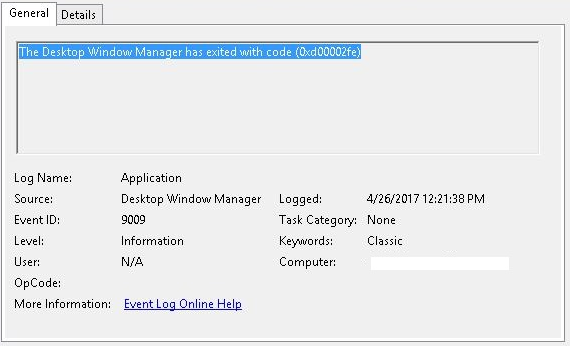 When doing an RDP from the source as windows to the destination, please also add, to the above, where will the documented log be found, on the source or on the destination. Thanks for the feedback. That’s a great question. 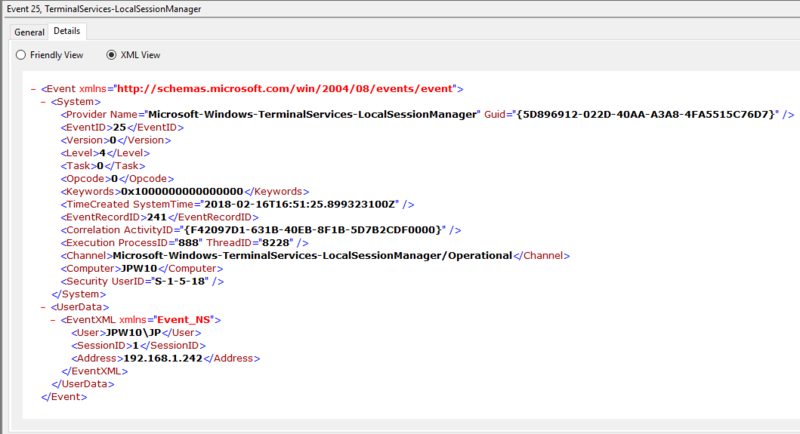 All of the Event ID’s referenced in this post will be found within the logs on the target system (the endpoint that is receiving the remote RDP connection). 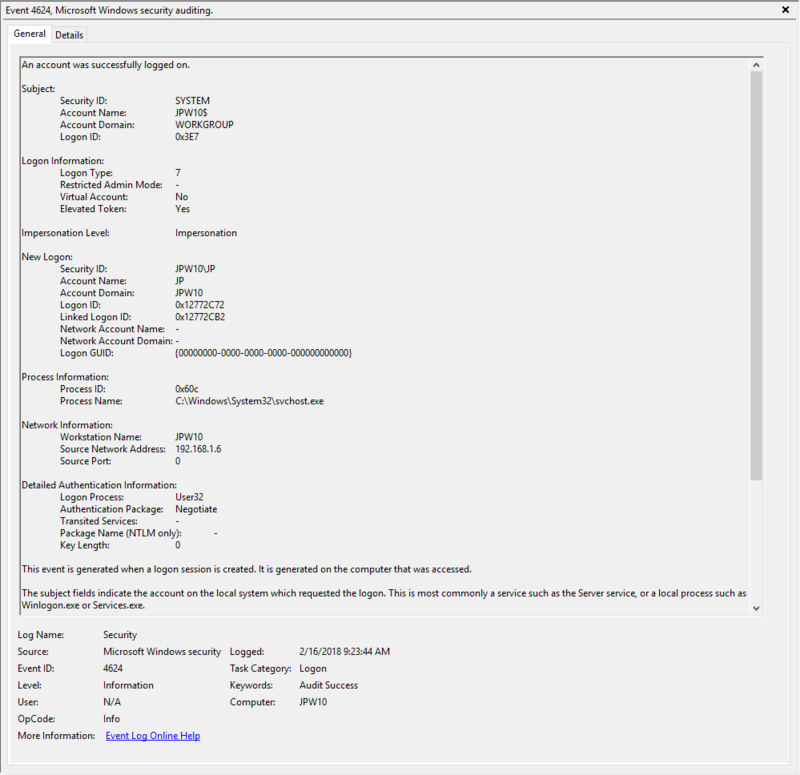 Historically, the main artifact on a source system (the system connecting to another system via RDP) was a prefetch entry for mstsc.exe (the RDP client executable) – namely MSTSC.EXE-462193BE.pf. 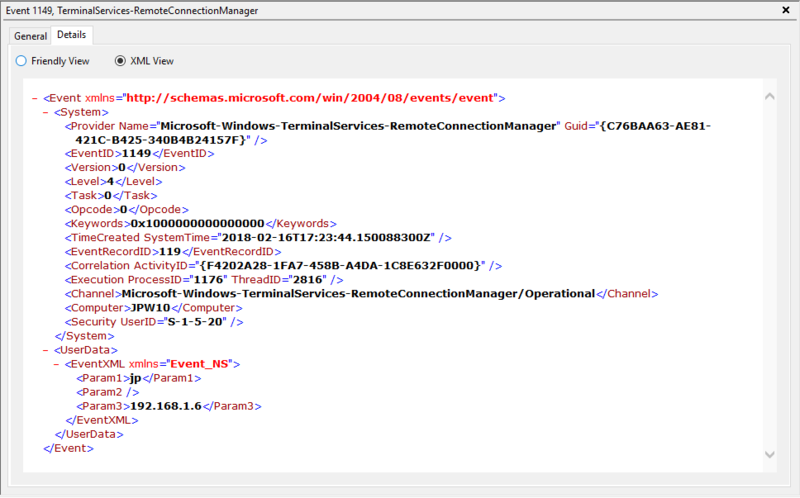 However, I’ve recently discovered another source of Event ID’s that provide indication and information on RDP connections to other systems. 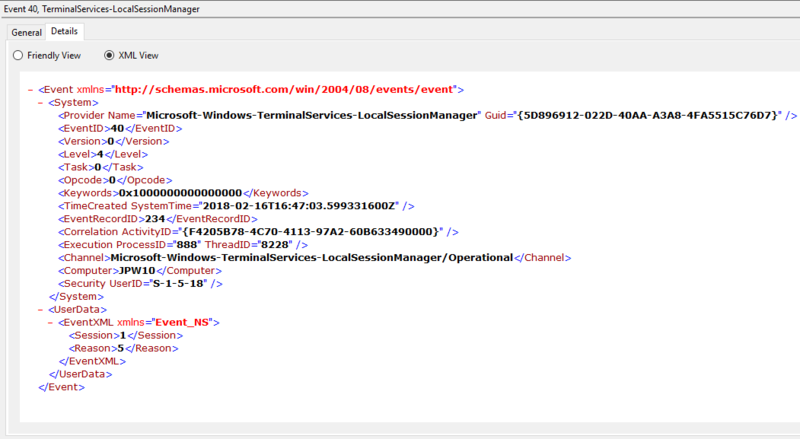 These events lie within the Microsoft-Windows-TerminalServices-RDPClient/Operational log (location on disk is %SystemRoot%\System32\Winevt\Logs\Microsoft-Windows-TerminalServices-RDPClient%4Operational.evtx). When a source machine attempts to connect to a target, various Event ID’s are logged here indicating the name/IP of the target as well as various related connection and disconnection messages which can also be helpful when investigating a system that is the source of RDP connections to other machines. Perhaps I will do another short write-up on that at some point in the future, or will send it out to the community and see if someone else has time to do so. Nice job ! Very usefull ! Maybe you should talk about NLA authentication which change RDP logon tracking. Thanks! 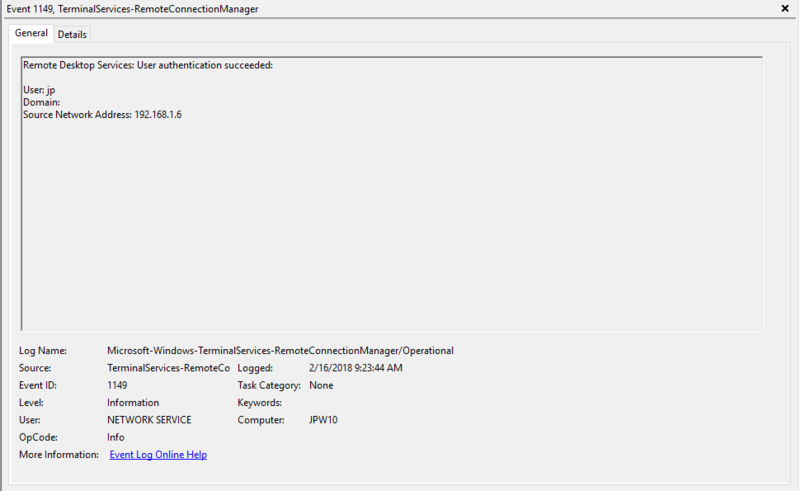 This post focuses on RDP using NLA Authentication. 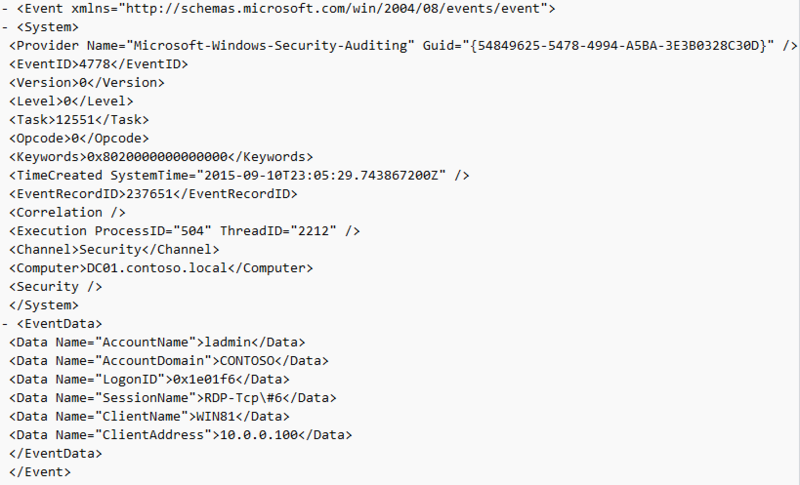 It doesn’t cover what would be logged at the AD for Kerberos or other authentication types as that’s out of scope for the focus here (identifying/parsing event logs on the endpoints/workstations). Do feel free to do a writeup on the AD aspect, though, as that could also be helpful. 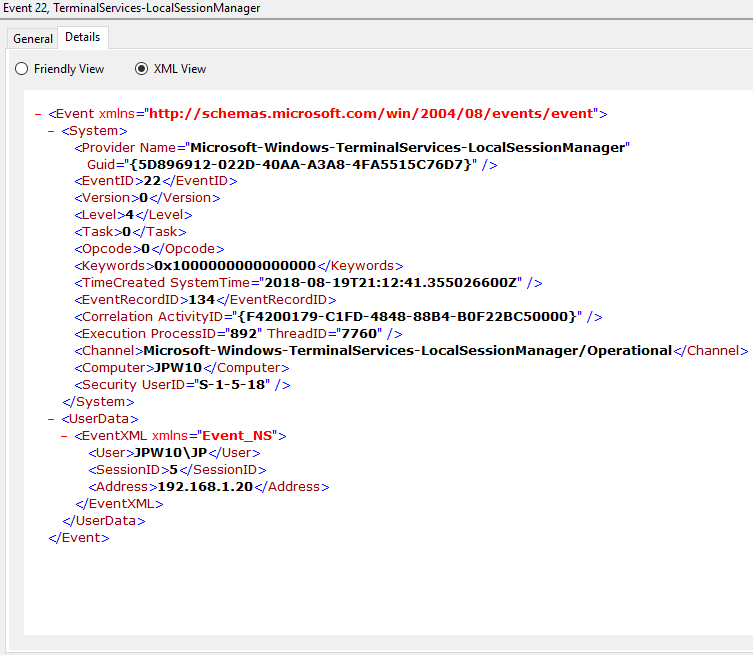 Is there a free tool that aggregates all the windows event logs to display the chain of events? Thanks! There are a few different tools you can use, each with varying levels of effort/involvement. The most popular and straight forward (once installed) tool is probably Plaso’s Log2timeline (https://github.com/log2timeline/plaso) as it has binaries available for Windows, Linux, and Mac. 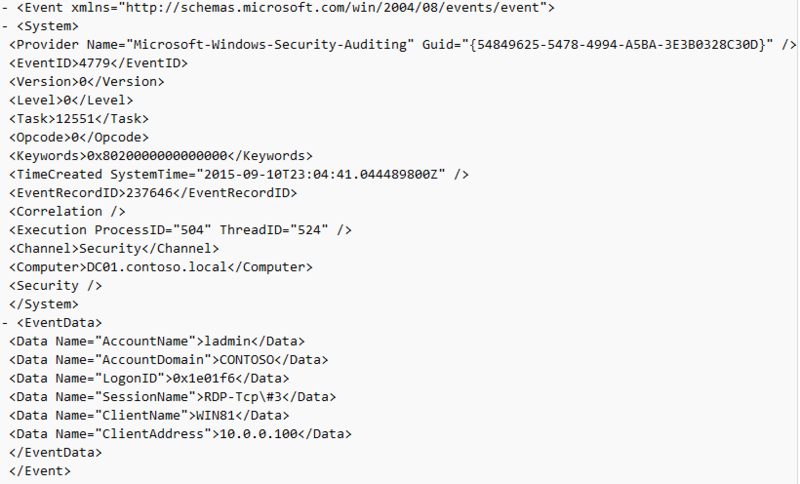 You can simply extract all Windows event logs into a single folder and point log2timeline at the folder with the appropriate parser (winevt or winevtx) and let it rip. 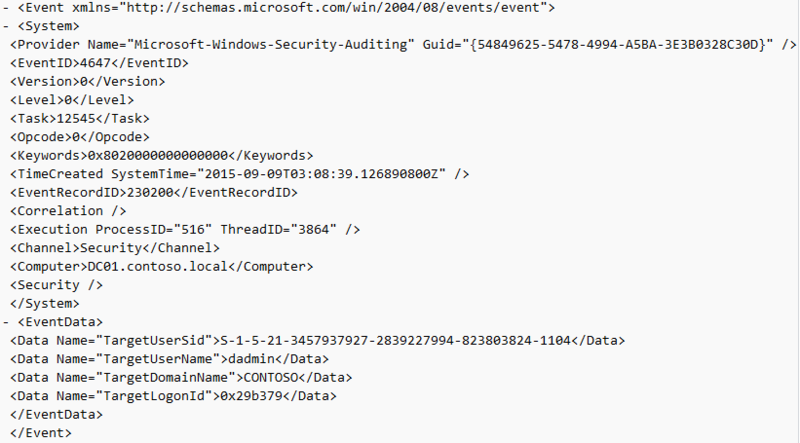 In the end (after running psort to output into a CSV or whatever file output type you like) you’ll have all* the processed Windows event logs in human readable form. *Plaso/Log2timeline has been known to have sporadic issues parsing things, so… caveat emptor. 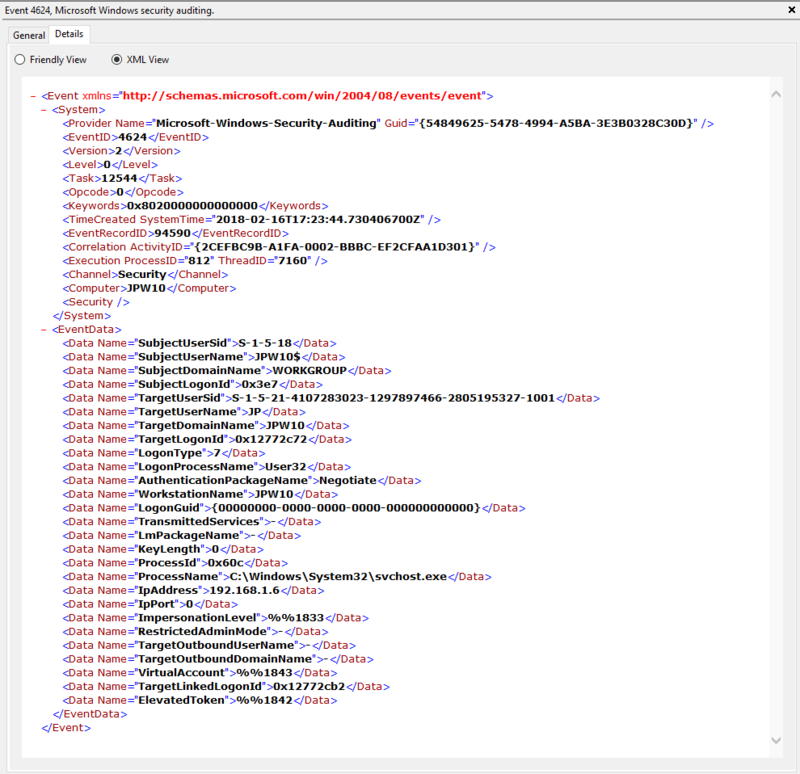 If you’re less comfortable in Linux or with the command line, Microsoft also has some great tools for parsing event logs called Log Parser (https://technet.microsoft.com/en-us/scriptcenter/dd919274.aspx), along with a “Studio” version (https://gallery.technet.microsoft.com/office/Log-Parser-Studio-cd458765) with some additional GUI bells and whistles. 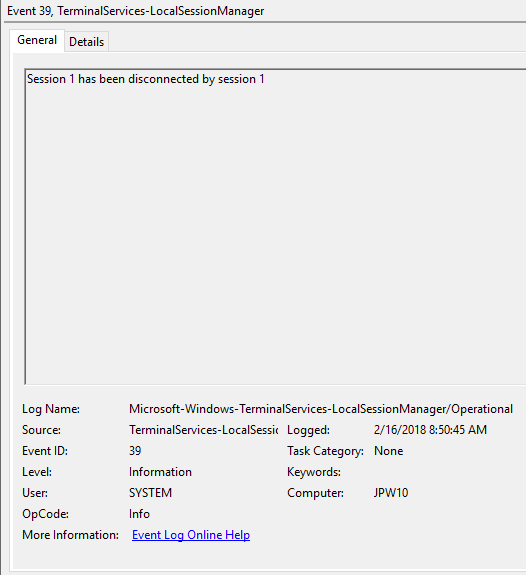 There is also another tool called Log Parser Lizard (https://lizard-labs.com/log_parser_lizard.aspx) which is another free GUI tool for Windows to parse event logs. At any rate, I could probably write an entire blog post itself on various ways to parse those logs, but hope the above helps! Can you confirm your setup? Thanks for the feedback, Jason. Glad it has been helpful to you! That is interesting… I’ve tested/verified this by a) Using a Win7 system to RDP to both Win7 and Win10 systems, and b) investigating Win7 and Win10 systems for RDP behavior. Though, Windows is ever-changing, so I wonder if something may be different in a Win10 -> Win10 setup or if something else is going on here. I can’t personally test at the moment, but obviously can’t argue your experience here. 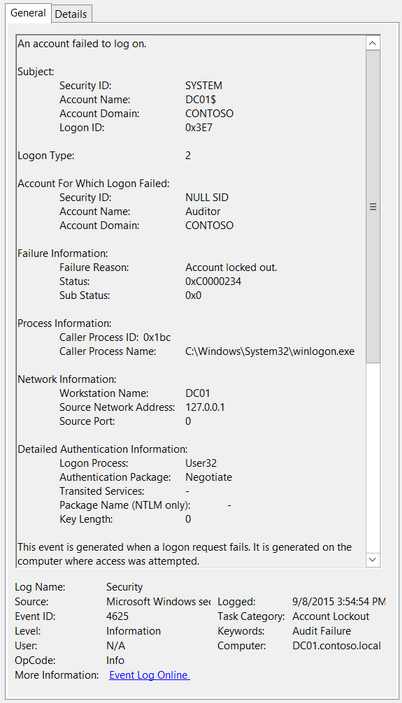 Though it doesn’t change the “1149 does not itself indicate a successful authentication”, it does change the perspective that these entries may not even be present on some Win10 onward systems (as would otherwise be useful to denote even unsuccessful attempts) unless a successful authentication has occurred (assuming something else isn’t going awry here). For what it’s worth, and just an interesting note. 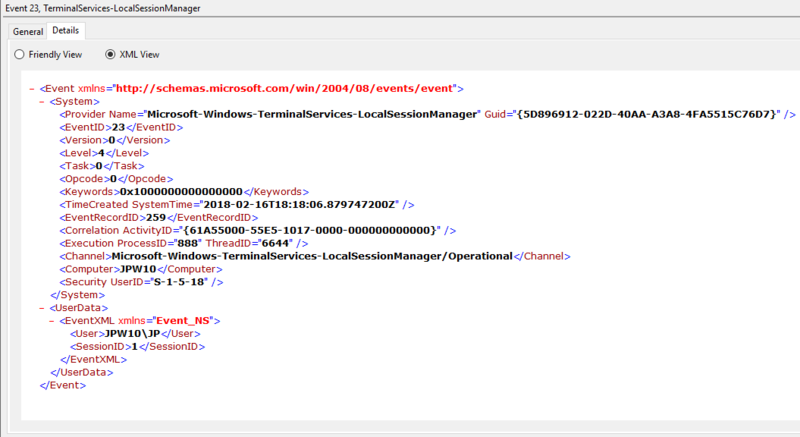 You have Event ID 21 with an IP address of “LOCAL”. 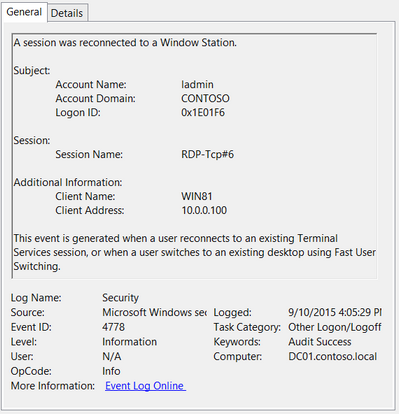 Based on testing this is merely a logon and not an RDP session. 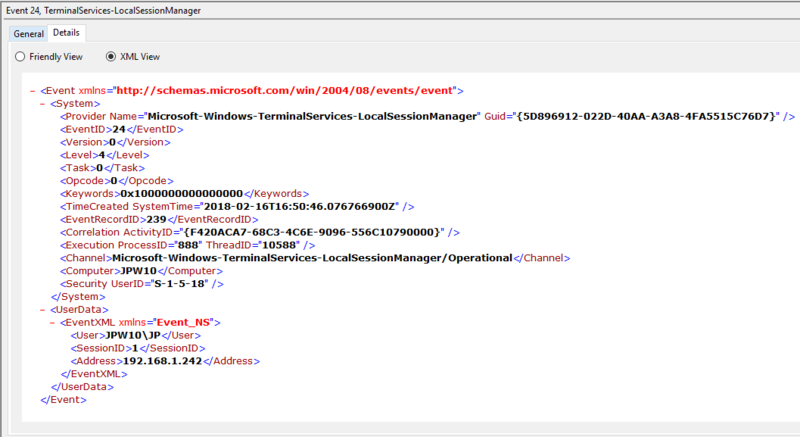 It appears that a logon will add an Event 21/22 with address of “LOCAL” to the \System32\Winevt\Logs\Microsoft-Windows-TerminalServices-LocalSessionManager%4Operational.evtx. 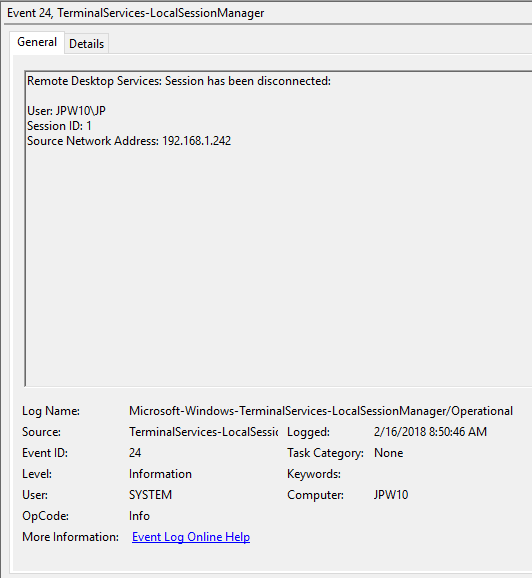 In my testing I found that Event 21/22 with an actual IP address listed is a clear sign of RDP session, but don’t state that simply an event id 21/22 with IP of “LOCAL” indicated an RDP session. Not sure if you came to the same conclusion, but do some testing and let me know what you think. Thanks for the comment. That is a great point. You’re totally correct in that anything with a SourceNetworkAddress of “LOCAL” would indicate a local logon and not one from a remote machine (hence, the “LOCAL”). This actually applies not just to EID 21, but also 22, 24, and 25. Great catch on my mistake in my event log capture for that example. I obviously captured the wrong one(s) and will update the screenshots here shortly to provide the proper example(s). 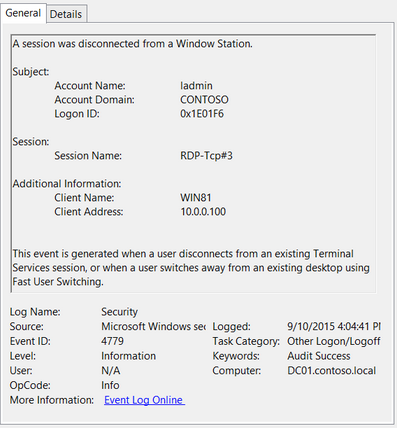 This is also a good time to remind everyone that this series is intended to denote a combination of logs that, when culled together and analyzed as a whole, can help indicate and track RDP logon history for a target. It was purposefully put together this way as Windows can be extremely ambiguous, unreliable, and downright initially confusing in what it logs (or does not). 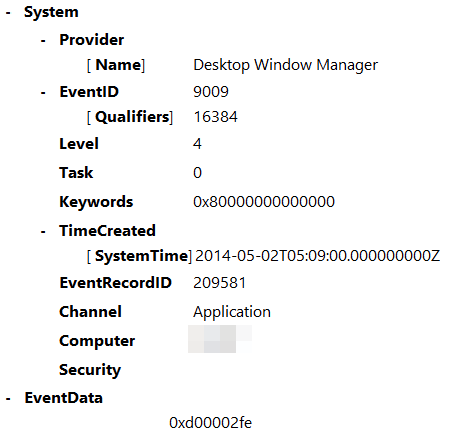 This is actually a great example of where simply looking at an individual log can be very deceiving and confusing if you aren’t looking at everything that also occurred (or did not) before and after, or simply are not yet well versed in RDP event log investigations. If we found an Event 21 in the logs without other surrounding supporting logs, we would want to take a step back and ask why they weren’t found. In this case, there would be no surrounding supporting RDP events because a 21 with a “LOCAL” source is not in fact an RDP logon as you’ve very aptly pointed out. Thanks for reading the blog/post and thanks again for your feedback. This was a great two-for (an opportunity to fix an error I’ve made as well as provide some additional context/tips for encountering EID’s with a “LOCAL” source). I’ve edited all the sections where this is applicable (namely for EID’s 21, 22, 24, and 25). Please let me know if you find any other additions or mistakes. Windows seems to be updating some of its core functionality and logging more and more frequently. So it is inevitable this will need to be updated many more times to come. Thanks for your great post! Can You tell me where i can learn about the session ID’s? What does a session like 2 tell me? 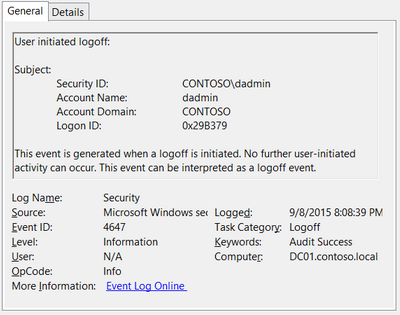 I presume you are referring to and not the “Logon ID” or “Linked Logon ID” you might encounter in various event logs. Here is a quick rundown on RDP Sessions. 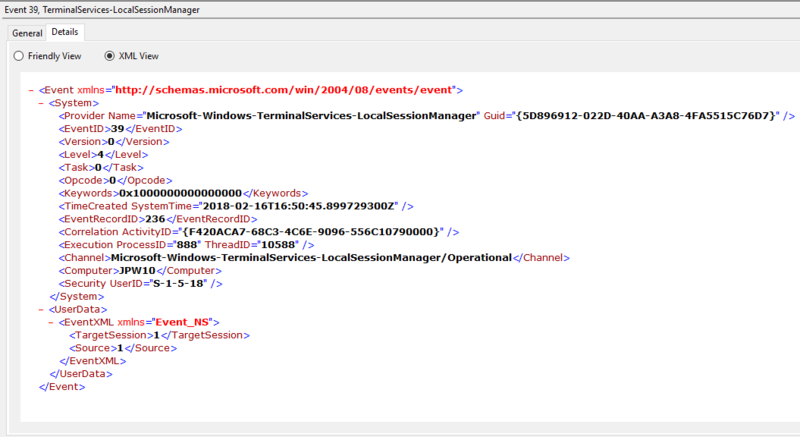 You can query the existing sessions (including RDP and local) on a machine by using the “quser”, “query session”, and/or “qwinsta” commands on an endpoint. 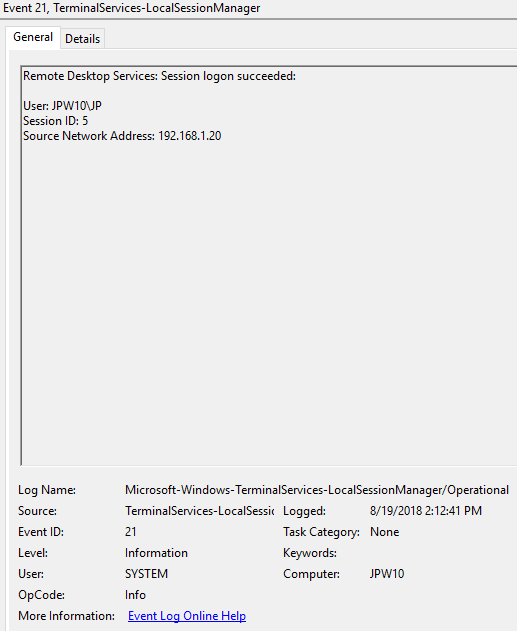 And, just for fun reading, you can see how you can shadow an RDP session on an endpoint. Let me know if that doesn’t answer the question. 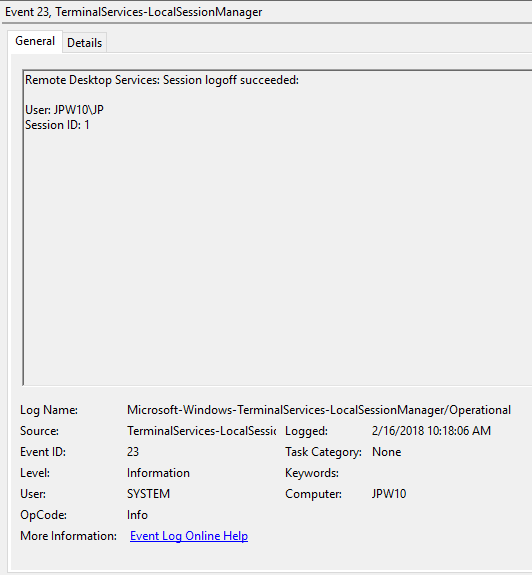 I’m trying to understand why a LOCAL logon (within Event ID 21) would be recorded within the Remote Desktop Services logs? Does this indicate logging onto the physical machine or logging on remotely via a device on the same network? Thanks for the compliment! And, thanks for the question. As I note in my post, an EID 21 with “LOCAL” as the “Source Network Address” indicates a local logon (person locally sitting at keyboard logging on) and NOT an RDP logon. A true RDP logon will have an EID 21 with a remote machine’s IP in the “Source Network Address” field and will be proceeded by an EID 22 with the same remote IP. It’s a bit confusing, I know. 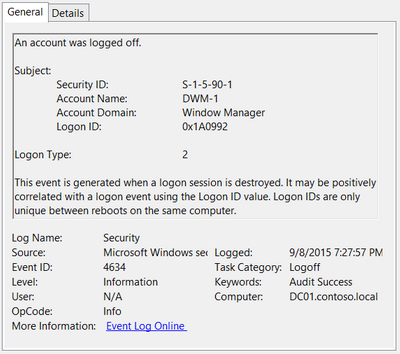 I wish I could tell you why, for whatever reason(s), Microsoft logs a LOCAL logon within the RDP LocalSessionManager log but I have no idea. This is just another one of those things where (at least for the meantime) you just make a note that it occurs so you don’t get hung up on it for future investigations. Perhaps someday someone can find out why through some more targeted testing and perhaps direct interrogation with MS, but for now it’s just one of those things (at least for me). Hopefully that clears it up a bit. If not, try re-reading the paragraphs a few more times until it hopefully sinks in. I had to do that many times myself until I was finally able to grok it all. Thanks again for reading and for the question! Hi Jonathan! This blog is of great value to the community! I have a question that isn’t exactly related to the previous entry: what is event ID 59? I have a log that contains several lines where there is an event 23 indicating a logoff, then followed by an event 24 indicating a disconnect, followed by event 39, and also a 59. Unless I misunderstand events 23 and 24, this looks like something unusual occurred. Most of the time, I don’t see 24 occurring with an associated 23, and wondered what this means. Thanks for the kind words, as well as the questions here. With regard to seeing Event ID 23, 24, and 39 together/in sequence, you are experiencing very normal activity. To understand when/how/why these might occur together (and in certain orders) you need to understand that events are often very atomic – one specific thing occurred and I am reporting on it (without respect or context to other things). 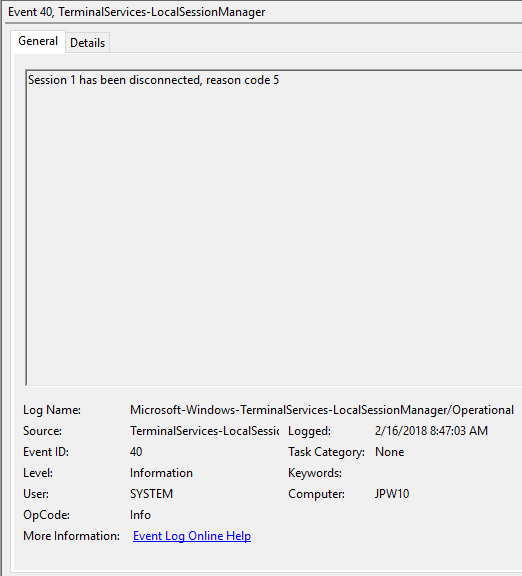 The logging system doesn’t care what happened before or after a given event, just that a specific event occurred that it needs to log and it does so. So, when you think about things in a very silo’ed and atomic approach like this, you can start understanding that a formal logoff from an endpoint might very well include several sequential atomic operations of EID 23 (user initiates formal logoff), followed by EID 24 (the formal logoff initiates an RDP disconnection), followed by EID 39 (the RDP session has been disconnected/killed). In this vein, a disconnect would also include a EID 24 followed by a EID 39 and/or an EID 40 (but no EID 23 as there wasn’t a formal logoff, just a disconnect via “X”ing our or similar). It is up to us as the humans to (attempt to) build the context and piece together the puzzle by putting all of these disparate atomic entries into a cohesive story of what (might have) happened. As you can see, the pairings and sequences depend on the action performed. So, both the presence and lack of presence of certain EID’s can help us determine the action(s). Though, the major caveat in all of this is that while we know what often “should” occur, sometimes Windows just flubs it up and does/doesn’t produce something we expect. So, at times it takes a bit of educated guessing (sorry, it just is) if we have overwhelming reason to believe something did/didn’t happen but we are missing one or two pieces of information that don’t fit into the puzzle. Sometimes there are valid explanations that we don’t yet realize, and sometimes unfortunately there just isn’t an explanation and we’ve got to do our best to properly document the surrounding context that underpins our assessment. This often nebulous and confusing situation of trying to put together a story from a wide array of EID’s was the genesis of me putting together this walkthrough to help people better piece these things together for RDP connections. 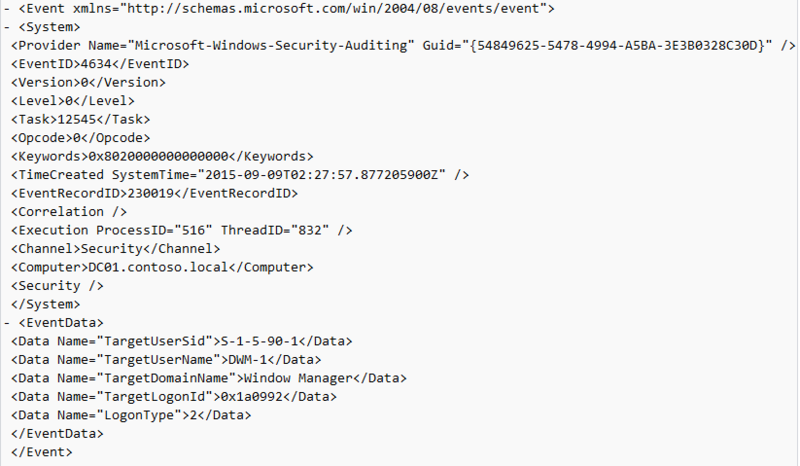 All that said, I’m not too familiar with Event ID 59’s. 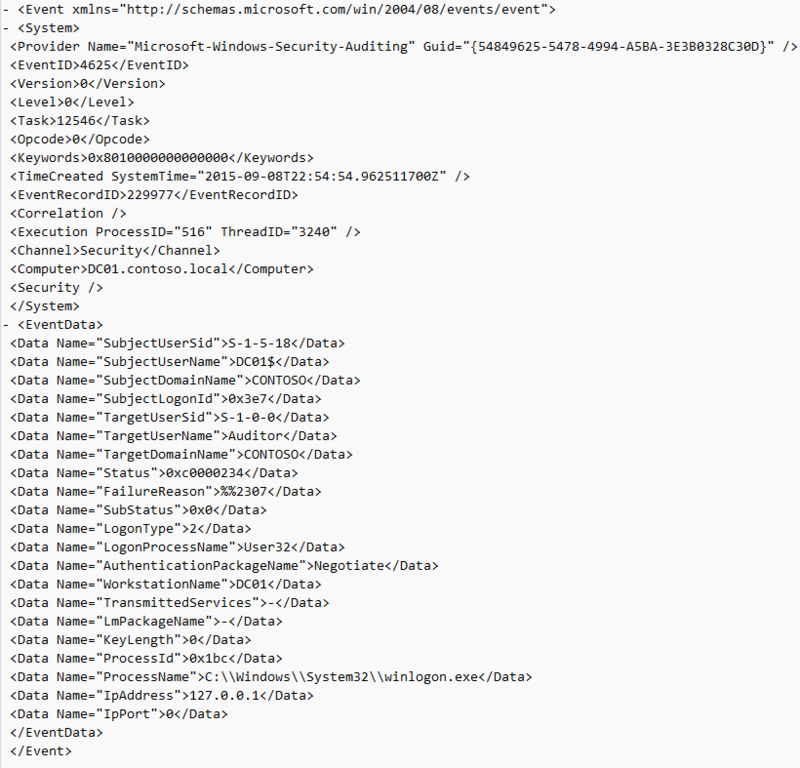 I’ve looked them up and see there is a subsection of the message called “ProcessingErrorData” with an associated “ErrorCode”, as well as ProcessID and ThreadID entries leading me to believe this may be more of a process error than anything directly relevant to tracking RDP connections. However, this is just my (marginally) educated guess as I’ve not had much direct experience with these. At any rate, hopefully that provides a better understanding of why you’re seeing what you’re seeing. If not, please let me know and I’ll do my best to address in a different approach. Thanks again for the feedback and questions.